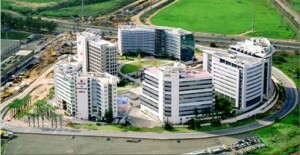 The Ofer Park Petah Tikva (previously: Park ,Azorim), is owned by Melisron Ltd. and Kfar Malal and compares with leading Hi-tech parks in Israel and Europe. The park is home to a variety of the world's largest international companies. The Ofer Park Petah Tikva is a green park situated ,within 10 acres of spectacular vegetation ornamental pools and fountains (all of which were designed with great care and at high financial investment), and serves as a perfect work environmen.